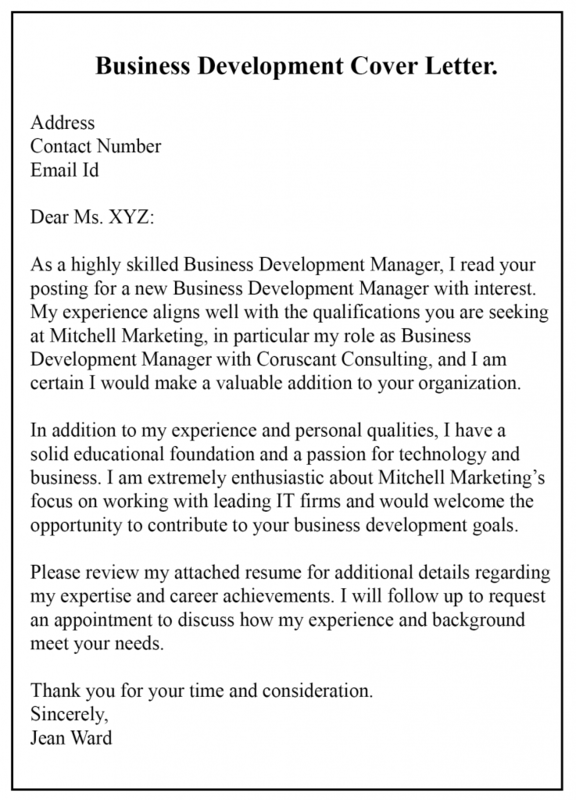 A business development cover letter is provided by the applicant along with their resume to their employer while applying for the position for business development. As you know, business development is a long-term process in the lifetime of any businesses related to strategizing plans and ideas related to finding the growth opportunities either within or outside the organization. Hence it entails the overall business environment by focussing on long-term value creation from customers, markets, etc. Since Business Development is such an important post and is necessary for almost every field of organization, it is recommended to write a cover letter along with your resume while applying for the position. To guide you to write a proper cover letter, we have provided you here with a guide on how to write an effective cover letter along with some templates. A cover letter is a must if you want to apply for any kind of job. It lets your employer know about your qualifications and skills required for the job in brief. In short, it will act as an introduction to your employer. So in today’s competitive world, working a good cover letter makes all the difference in enabling you to secure a job, since it shows your determination and efforts to secure the job. 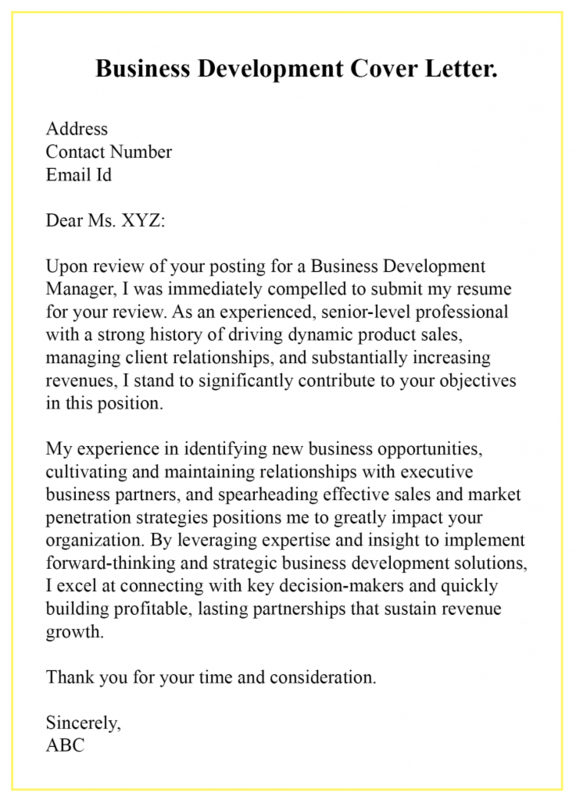 If you are applying for the position of Business Development in a company, it is very for you to apply with a cover letter along with your resume. Otherwise, your job application will look incomplete for the employer and he might prefer other candidates over you, even if you qualify for the position. A cover letter will be the first thing that will be read by your employer. Hence it must be well-written to create a good impression upon them. It helps you sum up your skills and qualifications, which you cannot do using your CV. Now let me explain to you how to write a cover letter. The introduction of a cover letter should introduce you and highlight your educational background in brief. Then in the second paragraph, you can tell your employers about your qualifications and achievements in brief. You can also describe your motivation to join the company and why the company must hire you. The part is the most important and can grab the attention of your employer. So make sure to pay extra attention to it. In the closing, you can write that you would love to be a part of the company and hope to hear from them soon. You can also thank them for their time and consideration. So I hope now you have an idea of how to write a strong cover letter and write a cover letter of your own. To help you write a cover letter, we have shared with you some useful business development cover letters which will find useful to take reference or ideas for your own cover letter. You can download these in PDF format from here.